This morning a friend received an email from Microsoft announcing the pre-order availability, starting at 9am Oct 16 2012, of their upcoming Surface tablet. 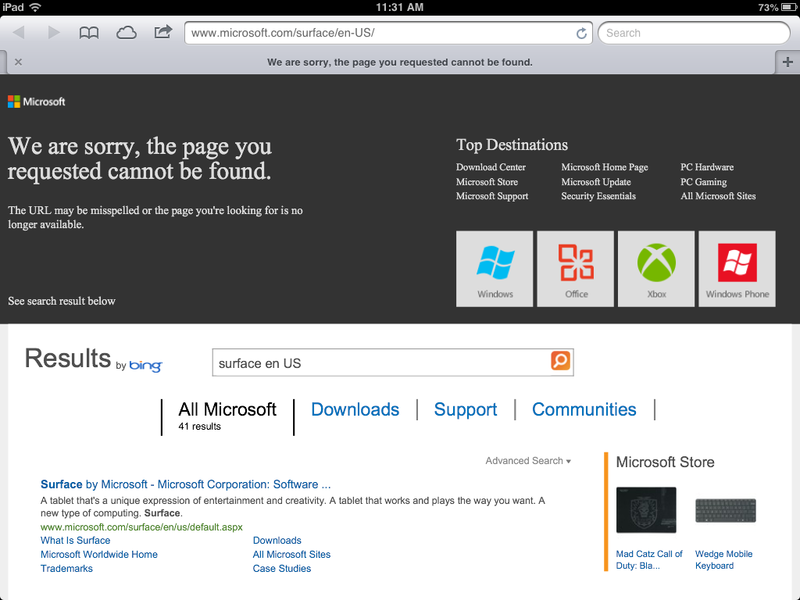 However, when attempting to click on the link to “surface.com” mentioned in the email it received a 404 error on the Microsoft website. The link seemed to be fixed within the hour, and at least 15 minutes prior to the 9am scheduled pre-order time mentioned in the email. However, this seems indicative of their whole tablet project. Now, I love to bash Microsoft and have fallen into the Apple fanboy category for much of my life, however, I am interested in technology and well designed products. Google always seems to be on the cusp of having something, but never quite makes the shift from the cool idea into the usable daily. Adobe has a ton of potential that I don’t think they utilize, opting instead for leaning too much on their history and legacy products. And Microsoft seems to be doing much of the same today despite having some great ideas, a smart and hardworking staff, and almost endless capital. They haven’t seemed to be able to ouster Google from Search or Maps, though Googles business practices are forcing partners to look at Microsoft as an alternative. They were not been able to bump Apple from the iPod and Music market and succumbed to the advancement of the iPhone in the smart phone market – only recently pushing back with Windows Phone 7 which was late to the party and has not made a dent in marketshare. And while they have the Xbox already in the living room, they cannot seem to make inroads into providing a competitor to Apple TV. Now, almost three years behind in the Tablet space they are trying to gain a foothold that has eluded other Apple competitors. The ideas they are bringing to the tablet are compelling, but they still can’t let go of their past. They cannot, or will not, just push into the future and say follow. Even after Apple has shown that a good product will drag even the enterprise crowd along. Instead, they leave us with a compatibility layer and a product lineup that is confusing. The new devices look close to the same – but won’t share the same software and won’t share the same feature sets. A legacy Windows world is left available, but is not geared towards touch input – while the new “Metro” Windows 8 style is being introduced to the desktop world where is fails as it IS designed for touch and smaller screens. Of course this new style is built off their Windows Phone 7 designs, however, software is not compatible and devices built only a year ago will not be supported in this update. Drop “Windows” already – move on! It is not the brand you think it is. To make things worse, Microsoft has run several dog-and-pony shows introducing the new tablet family but has yet to let reporters gain access to the new devices. So, they are now announcing pre-order availability – but for what? Don’t count me in on buying one. Lots of marketing, lots of hype, but no product is indicative of practices back in the 80’s and 90’s where both IBM and Microsoft would announce and sell a product in order to stave off competitors who were able to get to the market first. The difference then was that MSFT, and IBM in their day, were the big boys on the block – today they are dwarfed by Apple. Very, very few people are going to hold off buying a third generation iPad for a new, unproven, and un-reviewed Surface from Microsoft. I understand that Microsoft can’t stay quiet, Google and Amazon have both released new tablet devices and Apple is rumored to be releasing an expansion to the iPad family later this month. However, I think the choices, or lack of choices will lead to product confusion in the market and the marketing hype without solid reviews backing it up does not give me much hope in seeing long lines outside the Microsoft branded stores awaiting the product availability. And all that is actually kind of depressing for me, as I like the ideas the Surface presents. And the newly announced pricing is very competitive – Starting at $499 and topping out at $699 for 64GB w/ Touch Cover. Though I think it is lacking the cellular data plan options and GPS support (also feel the same about the Google Nexus 7). We will have to just wait and see – which apparently won’t be too much longer as shipping dates appear to be Oct 26th.